City Bus Tycoon HD iPhone Game Review: Fun Strategy Game! 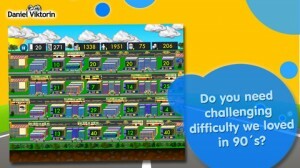 City Bus Tycoon HD is an iPhone game developed byDaniel Viktorin. Blending strategy with time-management gameplay, City Bus Tycoon HD is an addictive little game that’s well-worth the price of admission. There’s a good amount of value here. 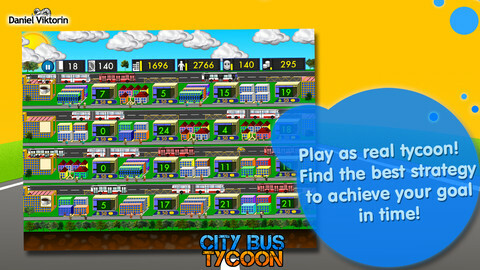 City Bus Tycoon offers players 50 levels to master. There are five station upgrades, and eight different types of buses to unlock. This game is relatively inexpensive, though for $2.99 I might have liked to have a few more levels. Still, 50 levels ain’t nothin’ to sneeze at. The interface here is solid. City Bus Tycoon HD is easy to navigate, and getting used to the rules of the game is a quick matter. I really like the multi-language tutorial option: not enough games have that. City Bus Tyccon HD hits me right in the sweet spot. I’ve got a buddy who actually helps to administrate the local bus system in my area, and he’s headed off across the country for grad school this week to learn even more about buses and city planning. This is the kind of game he would love, and it’s a game that I love, too. Who knows? This game could inspire future generations of city planners and bus administrators! Boasting a multi-language tutorial and awesome HD graphics, City Bus Tycoon HD is just plain fun. If you love “tycoon”-style games, City Bus Tycoon is way more fun that pretending to own a zoo or a lemonade stand. City Bus Tycoon HDis compatible with iPhone 3GS, iPhone 4, iPhone 4S, iPhone 5, iPod touch (3rd generation), iPod touch (4th generation), iPod touch (5th generation) and iPad. Requires iOS 5.0 or later. This app is optimized for iPhone 5.